Wahab Riaz (Punjabi, Urdu: وہاب ریاض‎; born 28 June 1985) is a Pakistani cricketer. He is a left-arm fast bowler and a right-hand batsman. He frequently bowls at speeds of around 90 miles per hour (140 km/h) and has reached 96 miles per hour (154 km/h). In 2013, Wahab married Zainab Choudhary, daughter of businessman Haji Shahid Choudhary in a traditional Pakistani ceremony. The marriage was an arranged marriage due to Zainab's family connection with cricket. 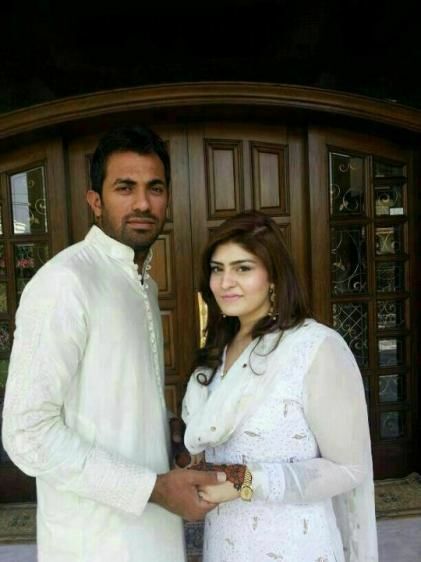 Both Wahab and Zainab were engaged to others prior to their marriage. The couple have a daughter named Eshal Riaz. 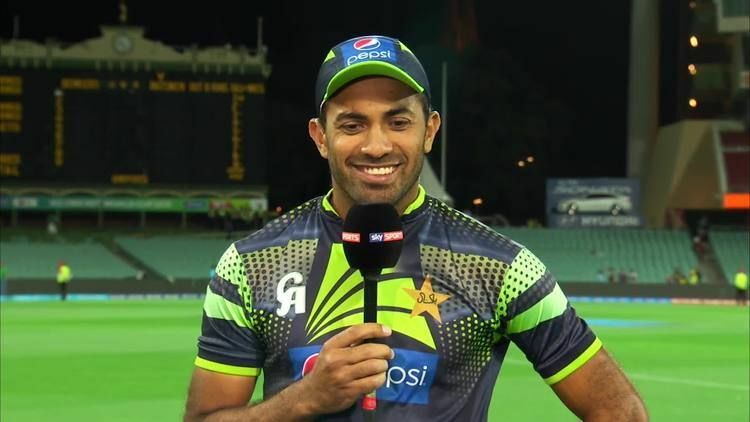 Wahab was chosen in the squad for the tri-series in Bangladesh which also included India and in his first match against Bangladesh; he finished with 3 wickets for 22 runs in 7 overs and in the next match although he took two Indian wickets he conceded 85 runs. Wahab made his Test debut against England in the third test of the 2010 series. England batted first and Wahab took 5/63 in the first innings. In Pakistan's first innings he came into bat at number 3 and made 27 runs. He next played for Pakistan in the Test series against South Africa in October 2010 he participated in 4 ODIs. He was selected to play in the first Test later in that series he took two wickets those of Graeme Smith and Hashim Amla however towards the end of the day he picked up a side strain. He did not bowl the following day. A scan showed that Riaz had picked up an injury which takes 4–5 weeks to recover from and thus he missed the rest of the Test series. In March 2011 he played for Pakistani team in at least four matches with an above average performance. However he really came in the limelight at the Pakistan Vs India semi-final of the 2011 Cricket World Cup, when he replaced Shoaib Akhtar and took 5 wickets. Shortly after the World Cup, Pakistan toured the West Indies for two Tests, five ODIs, and a T20I; Riaz was included in the squad. He took two wickets in the T20I, which Pakistan lost, and played in four out of the five ODIs, taking seven wickets at an average of 25.28 and finishing as Pakistan's leading wicket-taker in the series. In a report to the Pakistan Cricket Board (PCB) on the team's performance in the West Indies, coach Waqar Younis commented that Riaz had an "average" tour. In May Pakistan toured Ireland for a two-match ODI series, and although Riaz was included in the squad he did not play a match. After the tour of Ireland, Riaz entered talks with Kent, eventually signing to play for them in county cricket. The club had suffered injuries to their fast bowlers and Riaz was drafted in to bolster their line up. He made his twenty20 debut for Kent against Glamorgan on 11 June. He took a single wicket, that of Chris Cooke, and guided his team to victory with 32 not out, hitting the winning runs after being sent in up the order. On his home debut Riaz took a hat-trick – dismissing Chris Taylor, Ed Young, and Richard Coughtrie – and recording figures of 5 wickets for 17 runs (5/17) against Gloucestershire to help his team to an eight-wicket victory. It was the second time a player had taken a T20 hat-trick for Kent, and was the first time Riaz took five wickets in the format, beating previous best bowling figures of 3/14. During his spell with Kent Riaz took 13 first-class wickets at an average of 33.53, 9 in list A cricket at 13.33, and 20 wickets in t20 matches at an average of 19.85. 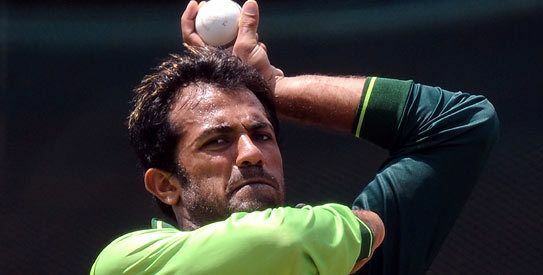 In August, Riaz was awarded a category B central contract with the PCB; six players were in category A, eight (including Riaz) in B, and nine in C. When Pakistan toured Zimbabwe in September, Riaz was rested with the selectors taking the opportunity to blood a number of new and inexperienced players. Though recalled to the Test squad for the three-match series against Sri Lanka, he did not play in the series and was dropped from the ODI squad to face the same opponents. Originally rested from the Test team to give younger players a chance, Riaz's hiatus from the squad extended to six months. His continued absence was not explained by the PCB. He was recalled to Pakistan's Test squad to face England for three matches in the United Arab Emirates. While he was out of the side, Riaz played for the National Bank of Pakistan in the Quaid-i-Azam Trophy. Before the squad was announced he had taken 30 wickets in the competition at an average of 24.86, and 213 runs at an average of 35.50. On 30 August 2016, he conceded 110 runs in his stipulated 10 overs, which is the second worst figures ever in ODIs. 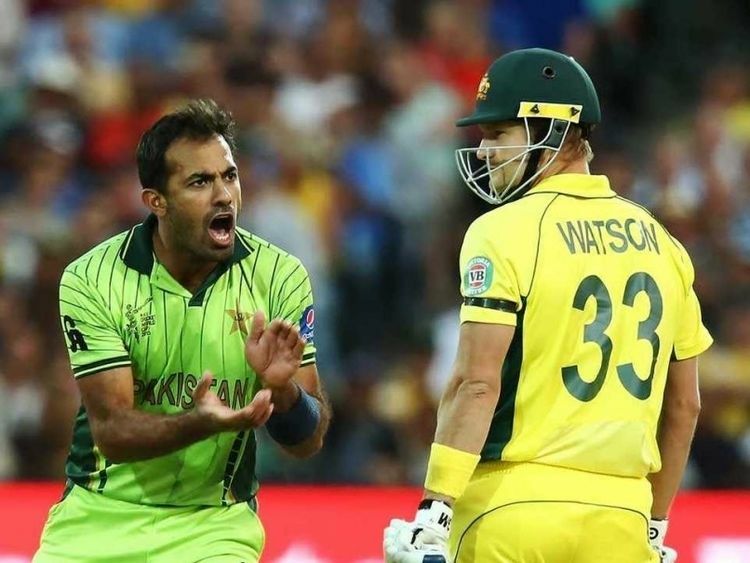 In World Cup 2015 quarterfinal match against Australia Wahab bowled a very aggressive spell. He showed some aggressive interaction by sarcastic clapping and a flying kiss to Shane Watson. ICC fined Wahab Riaz for the behavior. Riaz's spell won him plaudits from numerous cricketers past and present, with Michael Clarke referring to Riaz's performance 'as good as I've faced in ODI cricket for a long time' and Kevin Pietersen describing the spell as the "Best spell of bowling by a foreigner on Aussie soil for years". In the match Watson scored 64 runs off 66 balls, When Wahab Riaz was bowling his fiery spell against Shane Watson, he was dropped at 4 runs by Rahat Ali at fine leg off a 145kmh Riaz bouncer. Australia won the match by six wickets but after the match Wahab Riaz became a trend on Twitter. Brian Lara tweeted "I want to meet with this Riaz guy," adding that he would pay the fine imposed on Wahab by the ICC for his verbals at Watson. Wahab then invited Brian Lara to Pakistan through Twitter. Wahab Riaz was allocated as a Platinum category player in the 2016 Pakistan Super League players draft. He was bought by Peshawar Zalmi for $140,000 for the 2016 competition. During a group stage match in 2016 against Quetta Gladiators, Wahab had an exchange of words and a physical tussle with batsman Ahmed Shehzad. The Pakistan Cricket Board imposed a fine on both the players and issued an official warning to them. He was retained by Zalmi for the second PSL season in 2017. Peshawar won the 2017 competition and, as of the end of the 2017 PSL, Wahab is the leading wicket-taker with 30 wickets in 19 matches.